Revo SuperConnect review | What Hi-Fi? In the same way TVs have evolved into smarter, more complex machines, the same could be said for the ol’ transistor radio. The Revo SuperConnect is a great example. Not content with providing you with standard issue FM and DAB, the Revo has lots of extra features and functionality. Hook the Revo up to your home network (via wi-fi) and you can access the varied, and sometimes wacky, world of internet radio. It’s done through the built-in vTuner portal, and you can store up to eight presets using the numerical keys on the front. DLNA certification means the radio can also access music stored on a Mac, PC or NAS (Network Attached Storage) device over your network. Tunes stored on a smartphone or tablet can be played over Bluetooth (aptX Bluetooth is supported). Significantly, the Revo is one of the first radios we’ve seen to offer Spotify Connect, so if you have a Premium subscription can control and play tracks from your account. To get started, you just need to download the relevant Spotify app for Android or iOS. We’re big fans of the Revo’s aesthetics: modern with a dash of retro. The 2.7in OLED display and aluminium front panel contrast nicely with the cabinet’s walnut veneer. It wraps right around the unit, in a solid, sturdy build, while there’s a large volume dial on the right-hand side of the radio, which is easy to get to grips with. Menus and track information are shown in the display and it’s easy to read, although we did see some tearing with scrolling text. 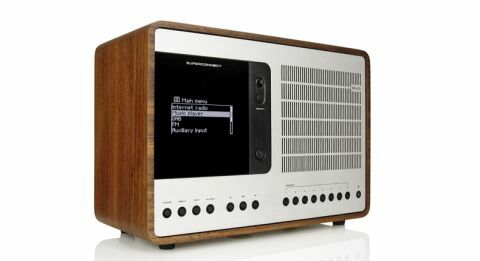 The Revo makes good use of screen space, showing relevant info for radio stations and songs (including bitrate and music format). The control system for the Revo uses a small joystick, just to the right of the display. It takes a couple of attempts to master, but the radio is quick to respond and it makes light work of the set-up menus. Supplementing the joystick controller is the supplied remote. We were expecting the usual credit card-sized handset but the Revo’s is pretty big. It’s great to use. You can use it to navigate menus, access preset stations and control playback when using Spotify Connect. Through the grille in the aluminium panel, you can just about make out the Revo’s single 3.5in BMR (Balanced Mode Radiator) driver, powered by a 15W amp. On paper, this doesn’t seem like a recipe for power, but the Revo kicks out an impressively weighty sound. It won’t appreciate being cranked all the way up to 11, but there’s scale and authority here. There’s no trace of harshness or brightness, and you will find the Revo sounds good no matter the source. Play Kings of Leon’s Don’t Matter through Spotify Connect and the Revo leaps to life, doing a great job with the high-octane tempo. As the drum kit’s high-hat smashes and crashes the radio sounds crisp and defined as does the wail of the electric guitar during the track’s solo. Caleb’s vocal has the trademark grit, but sounds smooth and rich with it. The way the radio handles voices lends itself well to dialogue-heavy radio and podcasts: football commentary on BBC 5 Live is entertaining. Bass sounds richer and fuller than we’ve heard on rival radios, although if it’s too rich for your taste, you can turn it down easily using the tone settings.